New to wave. I have the Hub in my living room and the smart switch in the Animal barn about 100’ away. There is one wall and a Plexi Window between the two. When I plug in a Light that is on an Extension cord that is coiled up next to the strip, it seems like the Strip stops responding to commands. When its not connected its much better, though the status of the outlets is not always right even after a refresh. I’m not sure if its a Distance or wire interference or? There is a Shed that is marginally closer than the barn, though not by much. Nothing really to Automate in there, though the ‘Extenders’ don’t really have good reviews. I’m still looking to move the Excess extension cord to the Light side vs the power strip side to see if that helps. That is correct, most zwave or zigbee devices won’t work well at those distances. 30ft or less depending on interference is completely realistic. The 150ft zwave distance is completely theoretical. Basically it would require 2 devices that both support that distance and nothing in between them, no walls, no furniture, no humans, no nothing, except air. 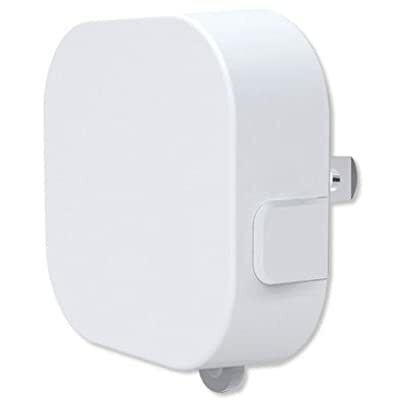 Zwave extenders are kinda a waste of money as any plug in or hard wired zwave device also extends the network and makes it more robust and they cost the same. Almost certain it’s the distance. Note that rain can also reduce the signal, a common problem with outbuildings. As @sidjohn1 said you’re just way beyond normal operating boundaries. The following topics may help. Each is a clickable link. Your best bet is to run power and ethernet to the shed and put the hub there. I moved into a new house and had all kinds of range issues myself. I got a few range extenders from Amazon to get coverage in the areas where I had issues – mainly between the hub and the garage. I’ve had no issues since I put these guys in to cover the intermediate area, and since the garage door openers are repeaters themselves they take care of the rest of the house. Perhaps you can come up with some sort of solution where you can plug in a couple of these at 25-30 foot intervals between the hub and the smart strip and have them relay the signal across the gap, but that’s a rather expensive solution. You can always plug in the power strip closer to the hub and plug in a 100 foot long extension cord that you can run out there, but that’s not pretty either. Below is a layout of the property. No easy way to get Ethernet to the Shop or Barn. There is ethernet to the outbuilding on the right, though its not that much closer. The Strip mostly works. Sometimes turning on one outlet turns on all outlets, and the status of the outlets is not always right. I will also see INACTIVE in the developer portal form time to time. I bought some extension cords to bring it closer to the ends of the ‘Barn’. The Barn is an Enclosed Cyclone Fence Dog Kennel. So I’m sure the Cyclone is messing with the signal too. I was thinking I could put an outlet on the side of the house and an outlet on the side of the shop that are more or less line of sight. hoping that then the outlet form the shop would have better connection to the barn. That’s what I would do to build your mesh network out as far as possible. The key is, the more devices in your mesh that is spread out, the better depending upon obstructions. The outlets would certainly help. What’s that distance, then, about 75 feet? I still think rain is going to kill your signal, though. It’s a problem with a lot of outbuildings. So just depends on use case and what you need the signal for. What’s the building on the left? If you also added one or two outlets there, it might help a lot. For Z wave, you’re limited to four hops Max, but having alternative is always good. And I think you could still use four to get to the strip. To go back to your original question about interference, it could be from the light, it could be from the cord, they could just be signal degradation from the mound of rubber that is the excess extension cord. Devices don’t have to be on the exact same frequency for interference if the signal is strong enough , which is why when you turn the microwave on you interfere with a whole bunch of electronic equipment. So for that when you just have to try trial and error. Since the shed is a metal building, there may be a limited number of angles for the signal can get through. Some people add extra windows to metal buildings just to allow for RF transmission. The Aeon Labs ZW075-A1 has a range of 492ft, place 1 in the main house on the wall closest to the barn and place 1 in the barn closest to the main house. If you want to be extra safe place 1 more in the shop for path redundancy (rain). This will max out your zwave hops to your AEON Smart Strip, but in theory should work. Also i would recommend going through Amazon as they have an amazing return policy if this doesn’t work well, but i feel this would be your safest bet. So for Giggles I moved the Hub to the Window on the wall that faces the Barn. I can tell already that its so much better. I have not added the 2nd Light and Fan to the strip that made it useless before. I’ll add those tomorrow and see how it goes. But when I got home today it was still INACTIVE. now its pretty snappy to turn on and off. The Other devices in the house seem to be operating fine too. So Its Possible I can either leave the Hub on that side or add that outlet to the outside of the house. Just Hurts Spending $30-$50 for an Outlet or Switch that you can get a Normal one for less than $5. Especially when I don’t really need an Outlet there. Since it would be outside facing I’d need to put a Rain-tight cover on it, so Im sure that would also limit its range. Maybe I just put the Outlet on the inside and it would only have the Siding to go though vs the metal rain-tight cover or the Sheetrock on the inside. 492 feet is the theoretical maximum for any z-wave plus device, but you’re never going to get that in the real world. If you’re lucky line of sight you’ll get about 300 feet. But that doesn’t include going through any walls and windows or anything. So you can pick any zwave plus device that is useful to you. It’s a good point, that the range is definitely better with any zwave plus than with the older Z wave devices, though. And sheet rock is a killer. Depends on the exact composition, but sheet rock and concrete and some types of insulation are actually even worse for signal degradation then metal. Glass isn’t too bad as long as it’s clear. And wood isn’t all that bad. So sometimes you just have to experiment. It does sound like putting the outlet on the inside might be better depending on whether you leave a little airflow through to the outside. Well, “approximately 500 feet” and “492 feet” do sound pretty similar, no? It’s all approximate when you’re talking radio frequency anyway. N/M I’m a moron, you did specify plus in your previous post… I just can’t read. Been there, done that, more than once. LOL!